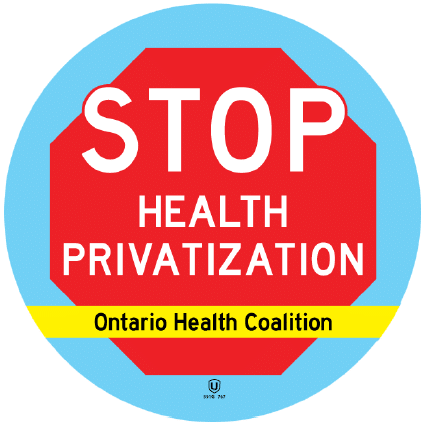 On April 23, OPSEU health care workers across the province are urged to wear a sticker to send a strong message to protect our public, non-profit health care services from privatization and cuts. The Ontario Health Coalition is coordinating this action with OPSEU, CUPE, ONA and UNIFOR - health care workers across the province are united in our opposition to health care cuts. Every OPSEU health care local will receive stickers and flyers in the mail the week before April 23. Please show your support! Wear your sticker on April 23 and encourage as many of your colleagues as possible to wear one too! Please also plan to attend the Ontario Health Coalition's Giant Health Care Rally at Queen's Park on April 30, 2019. Use your sticker as a conversation starter to encourage your friends and colleagues to come to the rally. Reserve your space today on a bus near you! Click here for a list of buses. It will be up to every one of us to get involved to fight back against Ford. There is strength in numbers, and OPSEU is coming Together to Win!